A water-line break caused an unusual landslide beneath an Anchorage condominium complex Monday. A Muldoon hillside suddenly gave way Monday morning as the 2-inch line spewed a slope-weakening deluge. 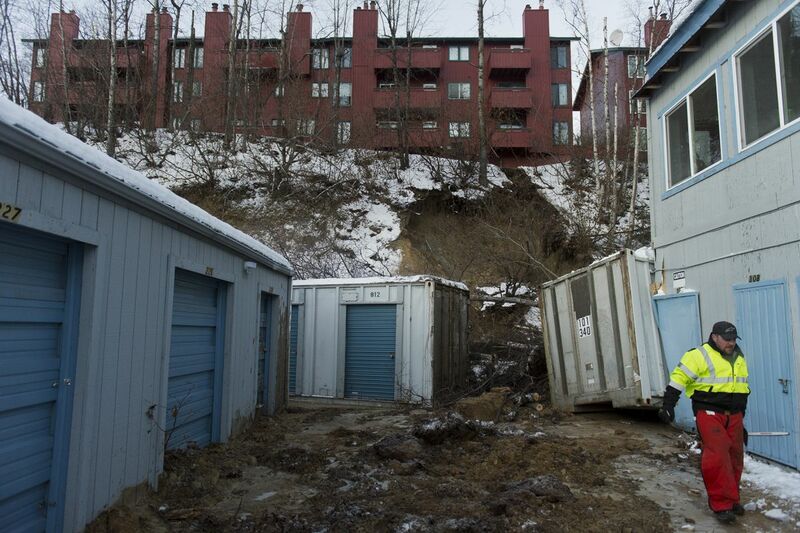 The 30-foot-wide slide damaged a storage business and temporarily displaced residents of the Victoria Hills condos atop the eroded bluff. The magnitude 5.0 aftershock Sunday morning may have been a factor, authorities say. The quake was one of thousands measured after the 7.0 earthquake that jolted Southcentral Alaska the morning of Nov. 30. A representative of the condominium association said the plumber who fixed the line found only “an old pipe that finally went” rather than any direct connection to an earthquake. If the pipe was already weakened by age, however, the November main quake followed by weeks of soil movement may have pushed it to the breaking point by Sunday morning’s aftershock, said John Thornley, a senior geotechnical engineer with Golder Associates Inc. in Anchorage. That’s even though a magnitude 5.0 quake isn’t that big or atypical for Southcentral. “The stress that was imposed by the magnitude 7.0 may have just put it beyond the brink,” Thornley said. Several municipal inspectors checked the condos Monday and found them safe to occupy, according to Ross Noffsinger, Anchorage’s building official. The slide actually started with a bang Sunday night. People living in Victoria Hills condo units heard a loud pop but didn’t know the source, Baker said. They woke up Monday morning without water. Then, around 9:30 a.m., the bluff gave way. A fountain of water, hundreds of gallons a minute, poured from the break into a crawlspace beneath the condos and out of the bank. Water was flowing from the broken line onto Peck and Muldoon Road, Baker said. AWWU shut off the water, but the broken section was owned by the condo association. The owners repaired the line. A nearby Anchorage Fire Department station at Bragaw Road got a call about the slide around 9:45 a.m., according to Chief Jodie Hettrick. There wasn’t much firefighters could do until the water was shut off. But there was “quite a bit of mud” stacked up on the storage units and concerns the situation would get worse, so they evacuated nearby buildings. Condo residents were evacuated Monday morning but allowed back into units once AWWU shut off the water, Baker said. Water was restored by around 5 p.m. 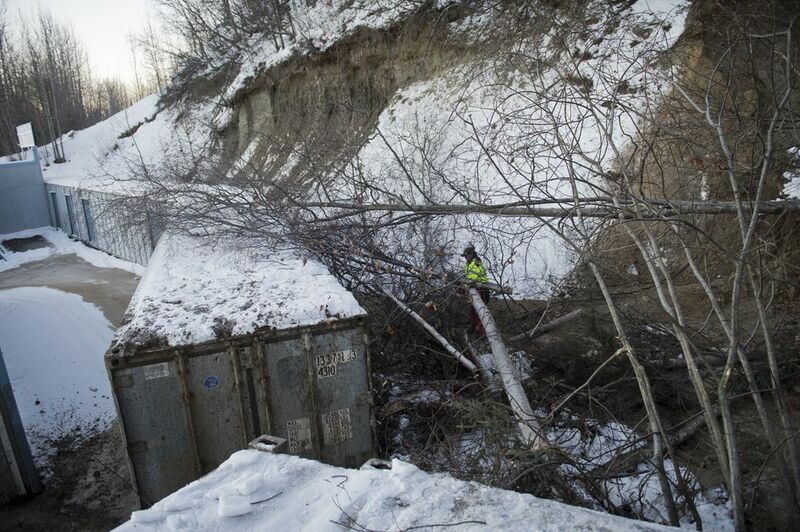 The slide left 3 to 4 feet of now-frozen mud tapering down to a foot deep on the property, Nelson said. “It pushed two of the storage containers, one of which slammed into the back of the main building." A back stairway was damaged, he said. About two dozen people live in the condo units above the slide, according to American Red Cross of Alaska spokeswoman Cari Dighton. Red Cross volunteers responded to a page Monday morning and talked with residents to make sure none needed housing Monday night, Dighton said. Nobody did.